Okay, we are not talking one book here, but two because this is a double volume. Both stories are about, dedicated English teacher, Jim Rook. Jim is not only adept at dealing with the metaphor and the simile, though, the guy can pretty much deal with any problem that comes his way, whether it comes from downtown, uptown, of the deepest bowels of hell. Jim had a near-death experience when he was a child and it left him with a new gift: he sees dead people. I am a big fan of Graham Masterton and have read quite a few of his novels. I have enjoyed them all. I enjoyed both these stories too. Snowman is the first story. There is something invisible on campus; something that can freeze things very quickly and very thoroughly. First, it is just the water fountain, then it is the whole of the men’s room, but when the entity starts on his students Jim is forced to take action. He must find out what is doing this and why. Once he knows that, Jim needs to find out how to stop it, and the answers that he seeks can only be found in the barren, frozen wastes of Alaska. The Second story is The Terror, and it is my favorite of the two. The trouble starts when a new student arrives in Jim’s class. At first Rafael Diaz is quiet and keeps himself to himself, but then he reveals a strange talent—he can cure people of their fears. Sandra is the first to be cured. She had Arachnophobia, but Rafael changed all that. He relieved some of the other students of their fears too. Then Jim’s students started dying. This alone would be worry enough for anyone, but Jim has other problems too. His cat, Tibbles, has returned from the grave, with a bad attitude and vicious tendencies, and Jim fears that his former love, Susan, might also be planning on returning to him. I liked the stories—I’ve already told you that. It was a double volume—I’ve told you that too. The thing is, during the second story Jim bought a pink Cadillac. Okay, not exactly masculine colours, but what the heck? He got it cheap. When I read the first story though, he had already got rid of the pink Cadillac. Strange, I thought. 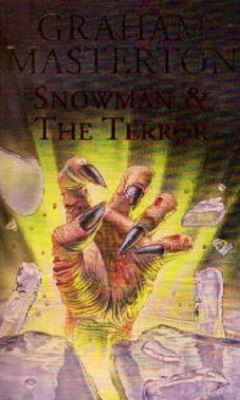 I had a closer look at my book and the first story in it, Snowman, is Rook 4, and the second story, The Terror, is Rook 3. The publishers have bound them together in the wrong order, so just be aware of this is you decide to buy the double volume. The fact that I ended up reading the stories in the wrong order did not cause any problems though. The stories stand alone. I have never read Rook 1, and that caused no problems for me either, although I do plan to buy Rook 1 and read at some future date. I don’t want to be too critical here, but I did find quite a few typo’s in the books, and when I encountered them they did tend to pull me out of the story a little.Bearing in mind that fact that the stories were not so much back-to-back as back-to-front, I am inclined to wonder if the spelling mistakes didn’t originate at the printing presses too.